Welcome to Jewel Heart Cleveland! Our Tremont center offers experiential classes, workshops, and special events based on Gelek Rimpoche’s authentic and accessible Buddhist teachings. All classes include practice of both analytic and concentrated meditation. On most Sunday mornings, we offer the opportunity to see a live broadcast talk given by Rimpoche. The Cleveland Chapter of Jewel Heart began in the late 1980′s, meeting in members’ homes and rented spaces. Since our move to Tremont in 2001, we have greatly expanded our schedule of classes and events. Our center includes a small store with books and other dharma items that is open during scheduled events, as well as a lending library with books, tapes and DVDs available to all. Scroll down or check the calendar for our upcoming events. If you have questions that are not answered on this site, please call 216-687-1617 or email cleveland@jewelheart.org. Click Here to download the Cleveland Sangha Council Members pdf. Demo Rimpoche to teach at Jewel Heart Cleveland, April 26 and 27! The Tibetan tradition of Buddhism was shaped by Tibet's commitment to authentically preserve and transmit Buddha's complete path to enlightenment through wisdom and compassion. 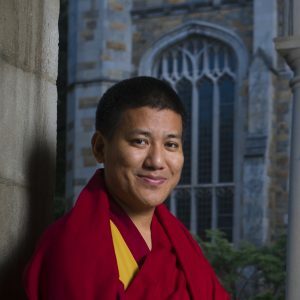 Join Demo Rinpoche in this public talk at Jewel Heart Cleveland introducing the unique methods and insight Tibetan Buddhism offers our world today. In this evening session, Demo Rimpoche will showcase the range of Tibetan Buddhist thought and practice through the four tenets, a uniquely Tibetan way of presenting the teachings of Indian Buddhist masters as a progression of views. On Saturday, Demo Rimpoche will continue this theme by teaching in more detail on these four systems of Indian Buddhist thought and practice as taught in Tibet. Demo Rimpoche's fluent English and practical understanding of this material will illuminate how these four systems exemplify increasingly subtle understandings of what Buddha taught about the nature of reality. Saturday, April 27, 10 am - noon, and 2 - 4:30 pm. Free and open to all. In 1987, Demo Rimpoche officially joined Drepung Loseling Monastery where he spent nearly thirty years of uninterrupted education in meditation, debate, philosophy, and so on, under the Dalai Lama's direct supervision. After completing these studies, Rimpoche received the highest monastic degree of Geshe Lharampa. He continued his studies at Gyume Tantric College and was a visiting scholar under the auspices of the Dalai Lama at Sera College of Higher Tibetan Studies in Dharamsala. At the request of Gelek Rimpoche, Demo Rimpoche came to the United States where he received a Master's Degree in Inter-Religious Engagement from Union Theological Seminary in New York in 2018. Currently based out of Ann Arbor, Michigan, he serves as the Resident Spiritual Advisor at Jewel Heart. Join Guy Newland, author of Introduction to Emptiness, as he walks us through these and other mysteries with reliable points for our analysis, contemplation, and understanding, ultimately leading us towards direct experience to investigate our own view on reality. Guy Newland is Professor of Religion and Chair of the Department of Philosophy and religion at Central Michigan University. Open to all. Voluntary donations are welcomed. Sunday, April 14, 11 am to noon. Beginner friendly, silent meditation sessions with light guidance as needed. You may choose to meditate on a cushion (we have several types available at Jewel Heart) or a chair. Led by Mike Sherman and other senior students. Mondays, beginning April 15, 7:30-8:30 pm. Free and open to all.